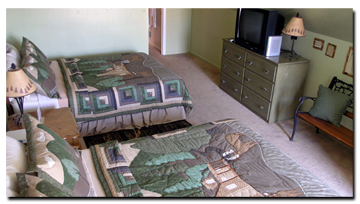 If you are looking for lodging near Zion National Park that won't break your pocketbook you have found the right place. The room in this historic house has its own private outdoor entrance and there is no interior access to the interior house so you have complete privacy. The room has satellite TV and a bathroom, shower and two queen beds. Cheap rooms in a resort setting with charm galore! 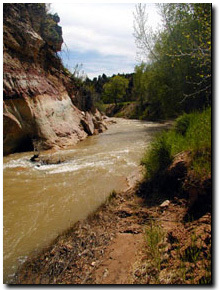 The East Fork of the Virgin River runs directly behind the house. The Heritage House was built in 1931, one year after the Zion-Mt. Carmel Tunnel was complete, Jack and Fern Morrison homesteaded the area now known as Mount Carmel Junction. The land was harsh and riddled with gullies, quicksand, layers of sand and was prone to violent flash floods. Jack set to work damming strategic locations so that when the washes flooded, the water would pour down from the mountains carrying vast amounts of silt to aid in filling the holes, gullies and washes and help to build the land. To make ends meet, Jack had to work on the railroad, leaving his wife and children for long periods of time. Fern, who was known for her baking skills, built a lean-to and sold pies to the truck drivers. In 1940, Jack and Fern built the Thunderbird Restaurant and over time they built the beautiful resort that is there today. The historic and charming Heritage House is where Jack and Fern lived until they built across the road.